Maggie Stiefvater will be in conversation with Melissa Cynova, author of Kitchen Table Tarot, one of her favorite books on tarot! Books will be signed, so come get yours! Every Thursday 5pm - 9pm Discounted Appetizer & Drink Prices for the Ladies! 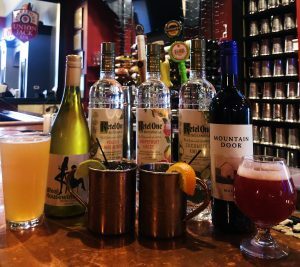 Ketel One Botanical Mules Pineapple Cider Magners Original Irish Cider Fruli Strawberry Wells Banana Bread Beer $4 Well Drinks Select Bottled Wine See you Thursday here at Union Jack Pub & Restaurant! Join us at Brewbaker's every Thursday night for Ladies Night & our featured live Acoustic music. Visit our website for the detailed schedule!